Here’s a post from the archives, originally published in 2009. There are delicious fresh local melons still available just about everywhere, including in my garden, so I thought the timing was right for this simple little soup to make another appearance. Enjoy! Did you know that cantaloupe and ginger pair well together? I didn’t, but I do now! I’ve been thinking a lot lately about chilled soups. I like to eat them, but for some reason I’ve never made one for myself. I keep buying vegetables thinking I’m going to throw them into my fancy new blender and create some amazing new soup, but then I forget and use the vegetables for other things. The most recent example is celery. I was thinking about making a light cream of celery soup and chilling it. But then I had this bizarre celery craving and literally ate the entire bunch of celery in two sittings. Yes, there was homemade blue cheese dressing involved, so perhaps that had something to do with it. Regardless, the celery was gone and I had no soup. So when I heard on twitter that another virtual lunch was planned, this time centered around chilled soups, I knew I had to jump in. Do you remember our virtual BLT Lunch from a while back? Well, the usual suspects are at it again today. Cheryl, who resides in New York, is today writing from Singapore about her Mum’s Green Bean Soup Recipe, while Ellise writes from Paris about Zucchini-Cilantro Soup. And of course there are many more. My original plan was to create a cucumber cantaloupe soup with fresh ginger and mint. But, as you might have guessed, I accidentally used all my cucumber and mint making something else (tzatziki, to be exact). So when I remembered last night that I needed to create a soup for today’s lunch date, I didn’t have much to work with. But there was no need to worry, this ‘minimalist’ Cantaloupe Ginger soup is delicious and refreshing and I’m kind of glad that I didn’t add the extra ingredients. I think this soup would work equally well as a starter or a dessert if you want to serve it in the evening. But today, it will be lunch. As with all of my recipes, this one should be customized to suit your own taste. I added a bit of half & half at the end and felt that it smoothed out the flavors nicely, but feel free to experiment and see what works for you. Put cantaloupe, ginger, lemon juice and honey in a blender, and process until completely smooth. Add half & half (if using) and blend until combined. Taste and adjust amounts of honey, ginger or lemon juice if desired. Serve well chilled. Don’t forget to search Twitter for #LetsLunch to see what the rest of the group is bringing to the party! And I just have to tell you one more time: I love my blender! Funny, I'm the opposite: I always have too many carrots, celery bunches, etc. around, and until I got my blender I used to throw them away a lot. Now I just make soup all the time and freeze it for later!Cantaloupe and ginger, who would've guessed? I used to eat melons by the ton when I lived on the west coast. I once made a cantaloupe quick bread scented with ginger and loved it, so I believe this soup would be delicious. This sounds just amazing. I adore cantaloupe (and ginger!). Cucumber, too, for that matter. Reading this makes me sad that summer's coming to an end this weekend. All the more reason to try this recipe real soon!Btw, your photo was just gorgeous as always...kudos! This looks so delicious and refreshing! Perfect for the end of the summer bbq or gathering! Great job! Picture is spot on!! This sounds lovely. I always admire everyone else's cold soups, but I never seem to make one for myself. (my hubby isn't much for cold soup) Maybe I should change that! This looks tasty. I would not have thought they go well together either. I wonder how it would be with honey dew? I like that much more than cataloupe. how lovely,,,i think the addition of ginger might push me over the edge and make me a cold fruit soup lover! beautiful photo, too. Loving this. In California the melons at the farmer's markets are still varied and ripe, can't wait to try this. Yum, this is such a unique combination of flavors and what a great excuse for buying up more cantaloupes at the farmer's markets (like we need any ;)). I've been having good luck with melons lately; Think I'll buy extra this weekend.ps: I have blender envy. I've always wanted to make chilled soup. Maybe one day, with these inspirational recipes, I will! When I fist heard the title is sounded great, but I wouldn't of thought to put the two together. I love ginger and try to add it to many things without the family saying "enough already". I'm not big on chilled soups, but I am going to make this one for sure! I love these kinds of cooking stories, mistakes, circumstances that create new ideas! Aren't new blenders fab? I have one, too, and I've got that thing whirring all the time. This soup looks simply dreamy. In fact, it kind of looks like a dreamsicle...but better. I love love cantaloupe, and with ginger, this sounds just marvelous. Love the flavors in the soup, looks so inviting! Chilled soups are such a great idea in the summer! 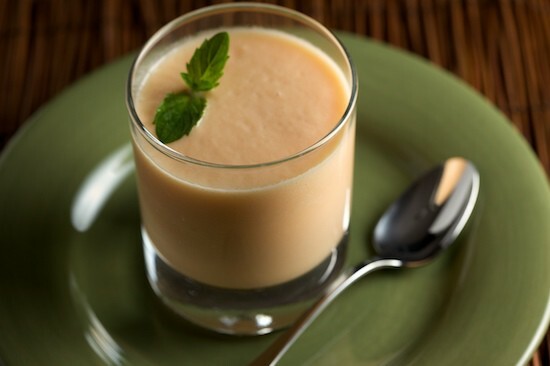 This recipe for a chilled melon soup sounds fabulous. Looks fresh and healthy. I made this yesterday! It was really GOOD. I could drink it like a smoothie. I def need to try honey dew next time. I think I was a little heavy on the ginger because the first taste was mellow but once it sat for a bit it got very gingery! But the flavors were fantastic together. I still haven't tried fruit soup, but this looks pretty good I must admit! That sounds really good. I always enjoy hearing about unique recipes that other come up with. If anyone is interested in some new blender recipes or submitting their own please visit www.blenderwizard.com! We made this soup for a party. (served it in cups from a pitcher.) It was delicious and a huge hit. We used half and half. Many thanks! I ended up modifying the recipe to include a drizzle of Tabasco to give it a kick. Not much, just a dash. I loved it. This soup seems really delicious. Thanks for this very quick soup recipe. It looks healthy too. It can prove the best refreshment as per my view. This looks so delicious and refreshing! Perfect for end of the gathering! Great job. Found this recipe over at The Soup Chick, where she featured it on her post "Seven soups every Saturday: Icy cold fruit soups." I just happen to have some cut cantaloupe in my fridge. It was a tad under ripe and we didn't eat it all, so I'm going to see how it works in your soup. Of course, I'd rather have the ripest melon, for sweetness and juiciness, but I suspect my less than perfect will taste wonderful with the ginger, lemon and cream.Anyone who makes her own blue cheese dressing is tops in my list, so adding you to my reader. Looking forward to more from you! Delicious looking CHILLED GINGER CANTALOUPE SOUP.Thanks a lot for it’s introduction to the masses. I have jotted down all the recipe.Hopefully try sometime…Thanks once again Nicole . Found this recipe over at The Soup Chick, where she featured it on her post “Seven soups every Saturday: Icy cold fruit soups.” I just happen to have some cut cantaloupe in my fridge. It was a tad under ripe and we didn’t eat it all, so I’m going to see how it works in your soup. Of course, I’d rather have the ripest melon, for sweetness and juiciness, but I suspect my less than perfect will taste wonderful with the ginger, lemon and cream.Anyone who makes her own blue cheese dressing is tops in my list, so adding you to my reader. Looking forward to more from you!